The photo that accompanies this blog post is a shot I snapped moments ago of part of an article that appears on page 22 of the current (June) issue of American Cowboy magazine. That issue commemorates the 20th anniversary of the magazine for which I was founding editor (and for which I was editor-in-chief for 15 years). The photo shows publisher Bill Bales (seated) and myself during the year (1994) of the startup. American Cowboy published a profile of Bill in this issue (that’s where this photo appears) and in the same issue I contributed a three-page guest editorial in which I looked back over the beginnings of the magazine and most of its history – through my tenure, anyway. I also wrote about the values that we instilled in the magazine. 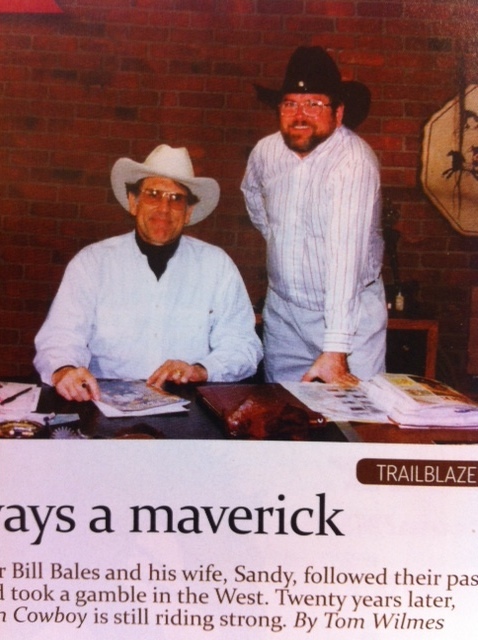 In another blog post on this site (“American Cowboy’s Backtrail: A Great Ride”) I add some details about the beginnings of the magazine and some insights into what it meant to those of us most involved in the enterprise. This occasion marked the first time I’ve written anything for American Cowboy in the five years since I’ve been away. I was invited to participate in the 20th anniversary project by the magazine’s new editor-in-chief, Bob Welch, and I thank Bob for his graciousness and for the fine job the magazine did on the issue, including the profile of Bill that was written by AC‘s former deputy editor, Tom Wilmes. Look for the issue on newsstands now. Better get it – milestone editions like this are worth having and preserving. Bill and Sandy Bales are coming to the Abilene home of Kit and myself in about another week for a visit – first time I’ll have seen them face to face in almost five years… should be a fun reunion!